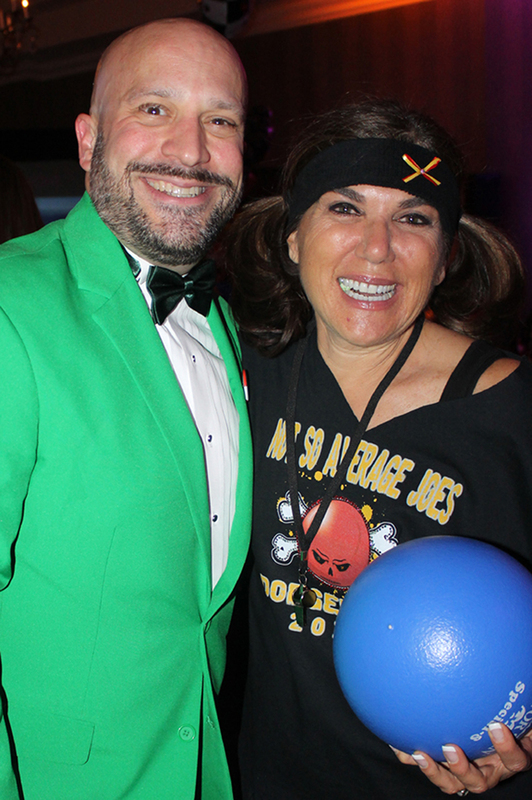 Event co-chairs Brian Koegle and Vanessa Wilk. Photos by Michele E. Buttelman. The fundraiser brought in real cash, not Monopoly money, with a live auction that netted $39,000 and the “Buy a Bus” solicitation that earned more than $40,000. (The Senior Center is in need of a new bus.) The final tally will also include sponsorships and money earned from script sales by the “celebrity waiters” during the event. Wilk said the SCV Senior Center provides a host of services to seniors including more than 50,000 meals to seniors on-site and 65,000 meals to homebound seniors; more than 45,000 discounted bus fares and emergency taxi rides; hosted recreational, educational and support group activities for more than 45,000 seniors; and it is responsible for completing more than 300 home rehabilitation jobs through its handyworker program. 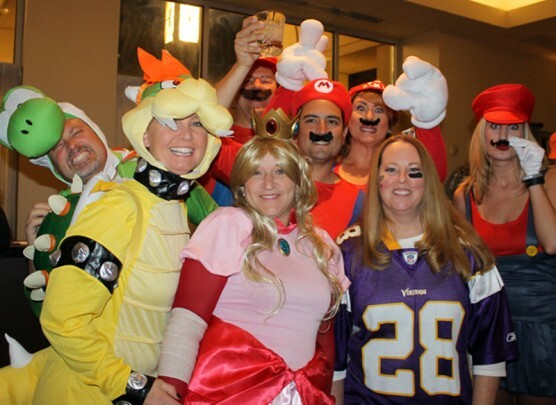 The event attracted nearly 300 costumed guests to the Hyatt Regency Valencia on Saturday. 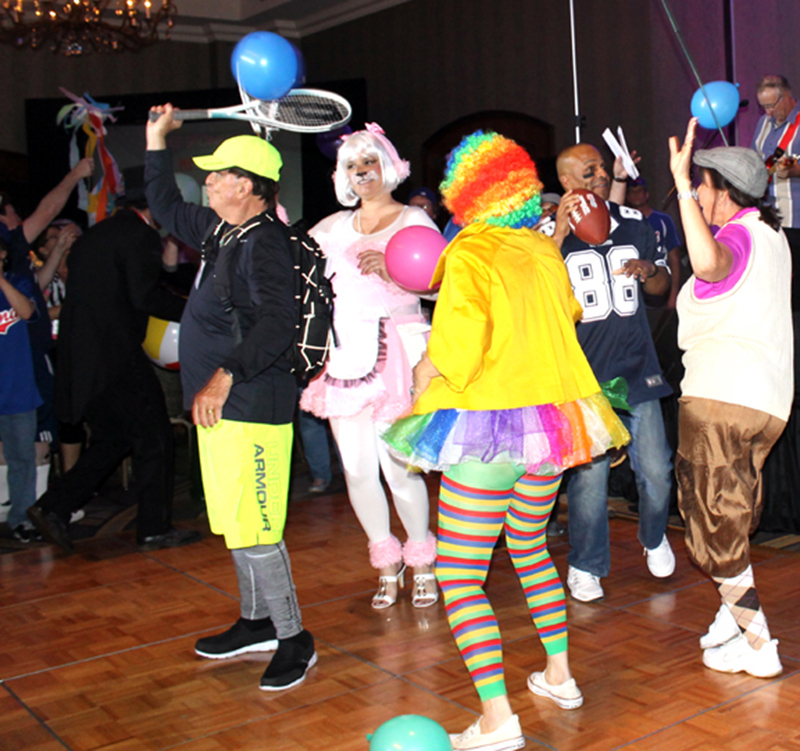 Guests were entertained by an introductory dance number by the celebrity waiters to the surf music of the SoundWaves band. Lauren McGuire and Miriam Robles co-chaired the live auction, which featured 15 items, many of them packages of events and getaways. Santa Clarita Mayor Bob Kellar offered a private party for 30 people at his Sand Canyon home. It sold first for $4,500, and then a second party was offered to another bidder who paid $4,000, earning $8,500 for the SCV Senior Center. 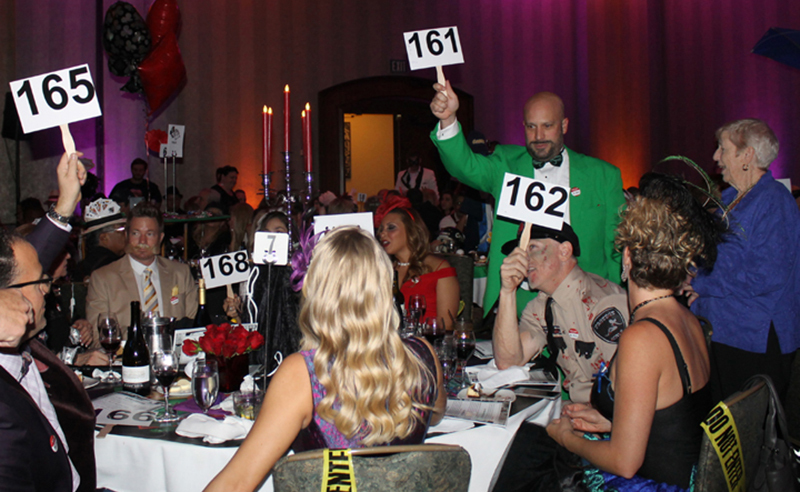 Celebrity waiters were volunteers who collected scrip throughout the evening by performing tasks for table guests. Bill Lively and auctioneer Curtis Waite work the crowd. Each table had a different theme and guests dressed in costumes to reflect the theme. The winning waiter, who captured “The Stanley Award” – named for the late longtime Senior Center volunteer Stan Sierad – was Michel Delcros of Le Chene French Cuisine. 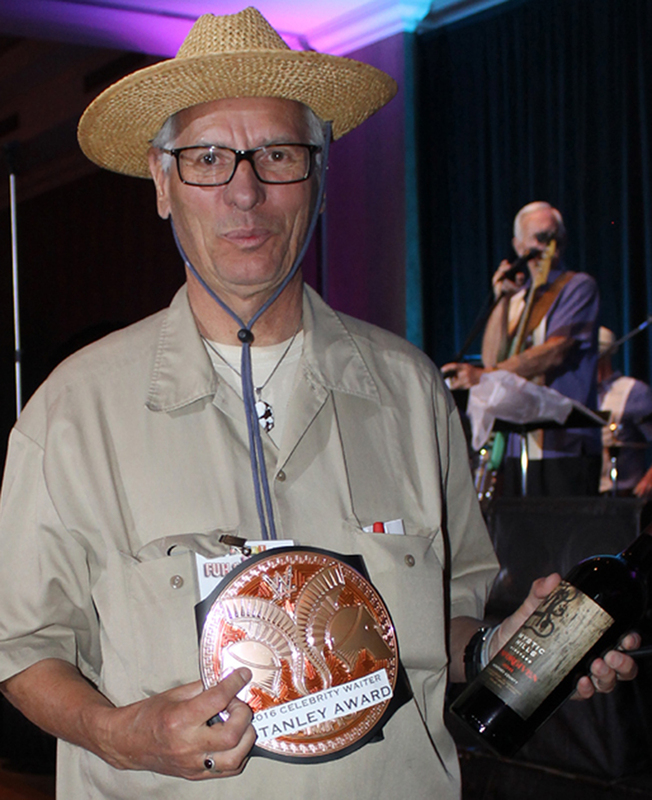 He raised $5,379 for the SCV Senior Center. “Michel has been raising money for months for the Senior Center,” said Wilk. Delcros served as waiter for the 2016 head table purchased last year by Dianne and Wayne Crawford. Other Celebrity Waiters included Stephen Bailey, Amanda Benson, TimBen and Ingrid Boydston, Jen Brown, Tommy Claffey, Robin Clough, Shauna Criner, Linda Davies, Ken Dean, Cookie and Frank Diaz, Gene Dorio, Alan Ferdman, Rob Gardner, Rick Gould, Yolie Haramia, Tracy Hauser, Michael Hogan, Flossy Vander Horck, Alesia Humphries, Roosevelt Johnson, Laura Kirchoff, Kirby Laner, Joey Levy, Zach McReynolds, Michael Owston, Sue Reynolds, Patrice and Ken Riftkind, Miriam Robles, Mikee Schwinn, Chuck Strong, Christ Trunkey and Nick Ventura. 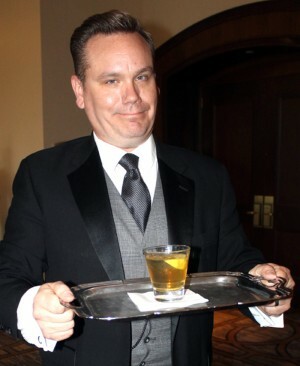 Michel Delcros earned The Stanley Award as the top Celebrity Waiter. He earned $5,000 for the SCV Senior Center. 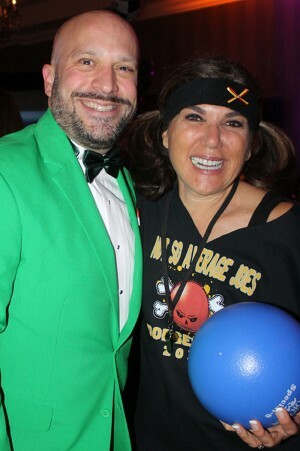 Other table themes included Wine Tasting, Vintage Vegas, Monopoly, Clue, Mario Kart, baseball, football, bowling, golf, poker, Super Bowl 50, The Amazing Race and other game-related themes. 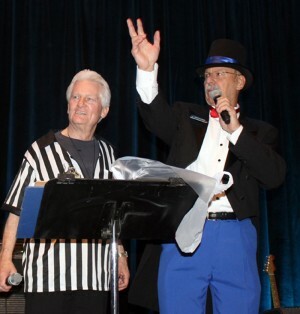 Bill Lively served as emcee, and Curtis Waite, The Auctioneer Guy, presided over the live auction and Buy a Bus request. An entertaining video presentation showing seniors stranded by the side of the road with their bus belching white smoke from under the hood made the point that the SCV Senior Center is in desperate need of new transportation. After the Buy a Bus solicitation, Peggy Rasmussen, president SCV Committee on Aging, was called to the stage to accept a symbolic key to a new bus for the SCV Senior Center. Longtime guest Coleen Schaffer said she has attended the Celebrity Waiter Dinner for 10 years. 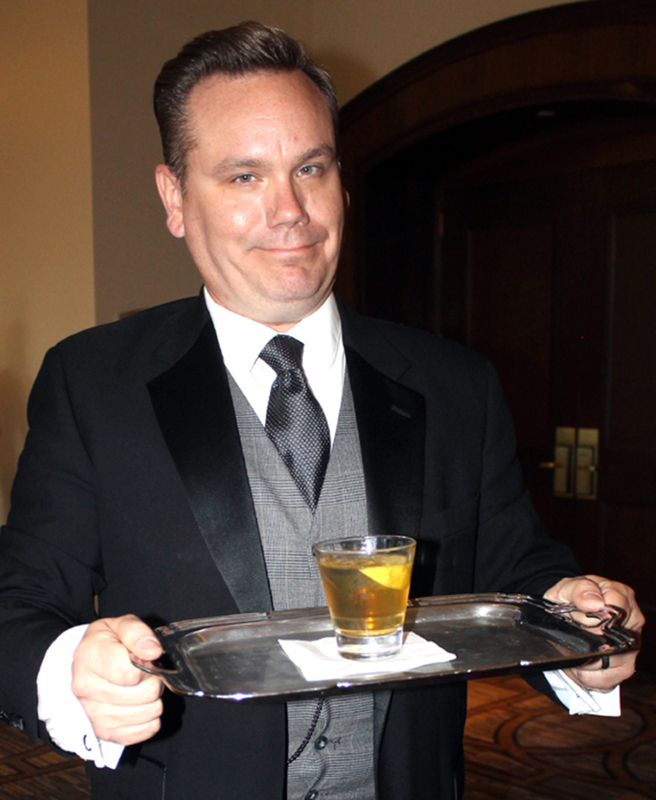 First time guest Beth Heiserman said she had fun at her first Celebrity Waiter event. Heiserman is the event director of the Sierra Pelona Valley Wine Festival, which will be held April 23 to benefit the SCV Senior Center. For tickets, visit www.reyeswinery.com. For more information about programs at the SCV Senior Center, or to donate or volunteer, visit http://myscvcoa.org. Guests at the “Clue” table raise their bidding paddles to support the “Buy a Bus” campaign. 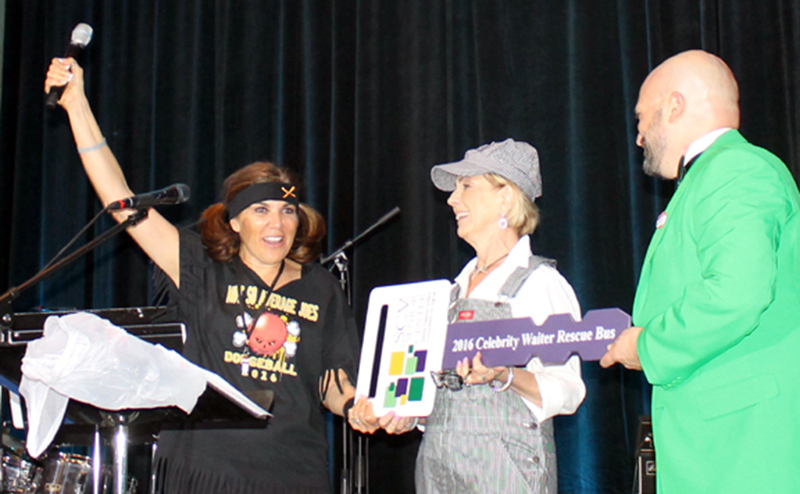 Vanessa Wilk, left and Brian Koegle, right, co-chairs of the 2016 Celebrity Waiter Dinner present a symbolic bus key to Peggy Rasmusse, center, president of the Santa Clarita Valley Committee on Aging Board of Directors, to celebrate raising enough money to fund the purchase of a new bus for the SCV Senior Center. 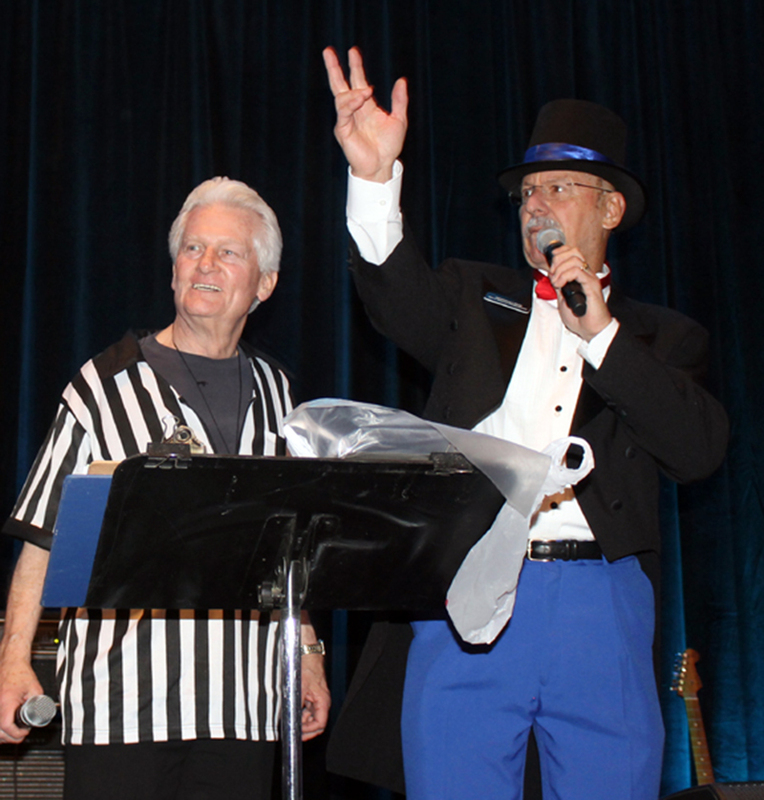 Celebrity Waiters are introduced to the audience at the 2016 Celebrity Waiter Dinner fundraiser for the SCV Senior Center.